If your vehicle uses premium gasoline you may want to take a close look at the prices for premium on the signs at the left. 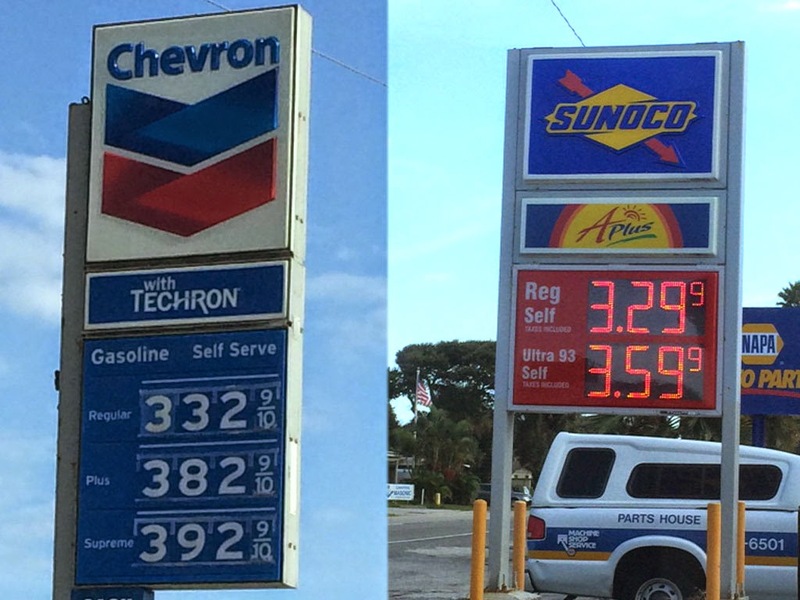 The Sunoco at 1st St. South was charging 33 cents less for premium yesterday when those pics were taken than the Chevron in south Cocoa Beach. Reminds me of asking prices on our MLS except that some people are actually overpaying for the Chevron premium. Sales have slowed to a crawl in Cocoa Beach and Cape Canaveral with just 16 condos and townhomes closed in the first half of September along with six single family homes. That's not surprising as we've closed a total of 481 condos and townhomes and 108 single family homes so far in the year and inventory is, to put it mildly, depleted. There are 241 existing condos and townhomes for sale this morning. That's equal to the number of units sold in just the first 18 weeks of 2014. As I've mentioned before, if we strip out the over-priced listings that have been languishing on the MLS for over 9 months, the actual inventory is below 200 units. There were some compelling sales among the 16 closed so far. Someone got a good deal on a direct ocean 2nd floor weekly rental 2/2 Cape Winds that closed for $175,000 as a short sale. It needed some TLC but will be able to generate good income for the new owners. A big direct ocean 2nd floor corner 2/2 at Coral Seas sold for $324,900. It had 1608 square feet and a garage. Another direct ocean, weekly rental 2/2, this one at Spanish Main, sold for $260,000. It had 1177 square feet and a garage and sold fully furnished. A small 2nd floor direct ocean Diplomat 2/2 with 900 square feet closed for $250,000. It was nicely remodeled and had no garage. An original condition 2nd floor Sand Dollar south view 2/2 at Royale Towers closed for $220,000. It was fully furnished and had a garage. A poolside ground floor Cocoa Beach Club weekly rental 2/2 sold for $205,000. 1098 square feet and carport only. A nice 2nd floor 2/2 direct Banana River Waters Edge West in south Cocoa Beach closed for $199,910. It had a garage and 1268 square feet. A 2nd floor furnished direct river Banana Bay 2/2 with 1316 square feet and a garage closed for $189,000. Two townhomes on Colonial Drive near downtown Cocoa Beach closed within two days of one another for $155,000 and $160,000. Both were 3/2 with a garage and the higher priced one was slightly larger at 1537 square feet. Someone got a very cool remodeled and furnished Aqua Sea 1/1 a couple of blocks from the ocean in south Cocoa Beach for $100,000. On the high side for 700 square feet not on the water but a gorgeous little unit. The fall mullet run is on in full force with gazillions of finger mullet running south along the shore. Mix those in with the bazillions of pogies already scattered just offshore and it makes it a good time to be a pelican or snook, tarpon, ladyfish, bluefish, spanish mackerel, jack crevalle or shark. All the latter can be caught from the beach with a live mullet, pogie or appropriate artificial. The big swell from Hurricane Edouard will arrive sometime tonight so don't expect much to get done in this town tomorrow or Thursday. The boys will all be calling in sick.